Earths Mightiest Heroes are launching with an all new Avengers #1 - just ask USAToday. 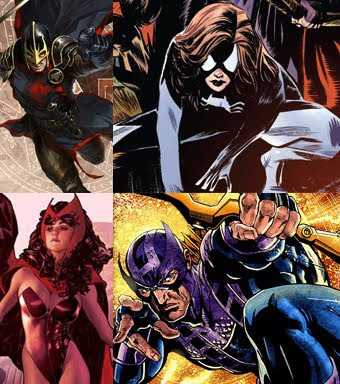 Add that to the fact there's some pretty strong suggestions on the jinxworld forums that both Avengers and Uncanny X-Men could soon be released three times a month, and it's a perfect time for the obligatory 'Dream Team Avengers' post. Captain America: The whole gig is based on the ideals of Steve Rogers. He doesn't live and breathe the Avengers, he is the Avengers. 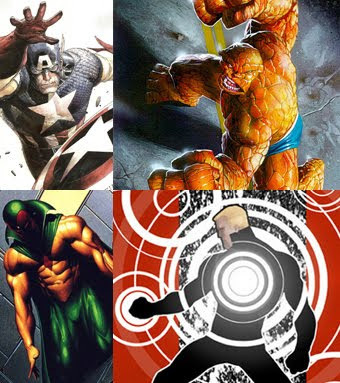 The Thing: Stepping out from the Four, the ever lovin' blue eyed Thing would enjoy a crack at some of the ugly mugs sported by an all new set of 'devourers of worlds'. The Vision: One of the true 'Avengers Trinity', their greatest enemy made him a robot, the Avengers made The Vision a soul. Havok: Having fought in the shadow of his brother Cyclops, been a villain and waged war in space, Alex Summers has the conflicted past of a classic Avenger. Now upon returning to earth and his original (and best) costume, Havok's new perspective sees him join the Avengers, not to defend the rights of one kind, but for the rights of all. The Black Knight: Few 90's Avengers are cooler than the Black Knight. Now the charasmatic warrior with the spirit of ten returns, bringing his predecessors winged horse, Aragorn along with him! Spider-Woman (Julia Carpenter): Ditching the name Arachne, Julia continues to juggle being a solo mother with her role in the Avengers, all the while grounding the team with realisim and maintaining team spirit, even in the loss of all hope. Scarlet Witch: Back in control, a renewed Wanda Maximoff returns, stronger in her beliefs and proving that despite the sins of her past, unlike her father Magneto, she is nothing to fear. Hawkeye: As indespensible to the Avengers as Cap himself, Clint is living proof of the change having something to believe in can cause in a person. Now the sarcastic archer joins the latest crew in order to be that 'thing' to the down-trodden in times of crisis. First things first, is it just me, or Beast look a little less catlike in the sneak peek from USA Today? Inspired by your JLA Challenge (which I STILL have to finish!) I threw a challenge out to the folks over at Comicbloc.com featuring the Avengers. A nice even 9. Might be a fun group, definitely some potential personality conflicts to play with there. Hey Doug! Thanks for the coments! Yeah I thought the Beast had reverted a bit from his New X-Men look as well, but hey with a Gorilla on both the JLA and the Avengers, it seams from that bit on USA Today, 2010 will be a great year for the simians! The team-up idea of your Avengers challenge is a great idea, would make for some interesting visuals too especially among the newer Avengers chosen. I might pick two of mine and put then in a pic and post it. Liked your line-up too - Sasquatch is an awesome choice. Underused, strength and brains, plus a cool visual to boot. I would use an Alpha Flight guy if I had to take mine out to an even 9 too: Shaman.